Following the restoration of the Victoria Palace Theatre for the opening of Hamilton, Wyndham's, Noël Coward, Gielgud, the Novello and the Queen's Theatre will all undergo improvement works. Work to Wyndham's, Noël Coward and the Gielgud will take place during breaks of the shows already running at the theatres. 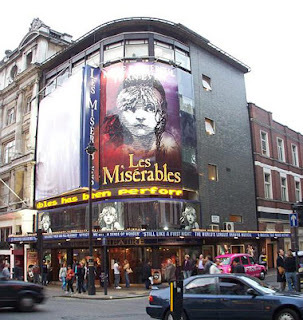 The Queen's Theatre will also close without LesMis breaking its run. The works come after historic plaster and paintwork conservationist Richard Ireland and structural engineer Chris Boydell of Connisbee inspected the buildings: it requires major renovation backstage and the closure will allow the restoration of Edwardian architect William Sprague's original boxes and loges. In a statement, the company said: "Plans are being finalised to ensure that this legendary musical success will continue its run in the West End during the Queen's Theatre closure and announcement with these arrangements will be made in the autumn." The first of the theatres to undergo improvements will be Wyndham's, starting early next month. Then the Noël Coward and Gielgud will follow in 2019, with works to the Queen's taking a period of two to four months in 2019-20. The Novello Theatre has already had over 50% of the required work completed and the remainder will be carried out without any loss of performance. Mackintosh said: "Having just completed the hugely rewarding but very expensive restoration of the Victoria Palace, news of the timing of these works which are necessary to ensure that my other theatres will be in tip top condition for actors, producers and audiences, long after the final curtain has dropped on me, was not the most welcome.There are major financial consequences, not just the considerable cost of the capital works, but the knock on costs of closing these theatres for several months will run into many millions of pounds. However, I love these buildings and luckily my success as a producer has given me the resources to preserve their life for another 100 years - so that the show can go on and on and on!"